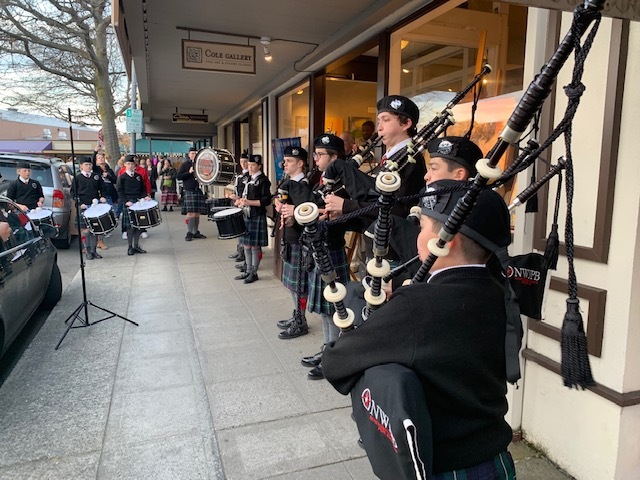 Thursday night Edmonds art walkers got a mid March surprise when the Northwest Junior Pipe Band cranked up their pipes and drums for an unexpected evening stroll at the First Thursday Art Walk. This group of young musicians, ages 8 to 18, showed up wearing full Irish regalia along with their director, Shoreline resident Kevin Auld, and a large contingency of parents. The weather cooperated and people came pouring out of the stores to stand and enjoy the wonderful Irish music while the drummers put on a flashy show of their own. Correction: Kevin Auld is the leader.